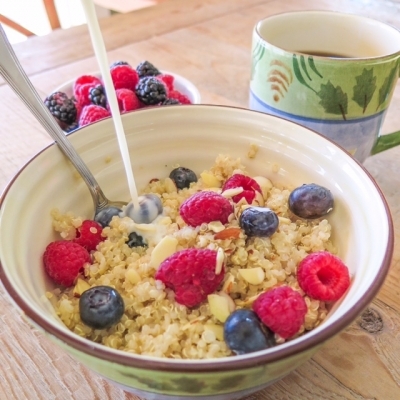 A delicious and protein packed alternative to oatmeal. In a small pot, bring 1 cup of water to boil. Stir in quinoa, reduce to low heat, cover, and simmer, until water has evaporated. Next, take off heat and stir in protein powder, truvia, and ground cinnamon. Pour into a bowl and top with berries and sliced almonds.